Congratulations to Jennifer Olson, Supervisor of the Greene County Center, for 10 years of service with OACAC! 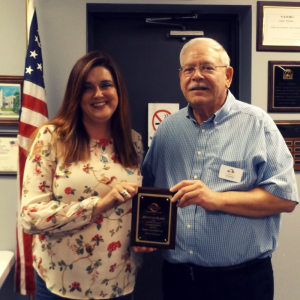 Jennifer was recognized at our area board meeting on 9/25/18 and she is pictured below with Executive Director, Carl Rosenkranz. Many thanks to Jennifer for her work in helping people achieve empowered self-sufficiency and for being instrumental in the development of the REALL, VOICE, GOAL, and HOME projects.